I am so happy to have had the opportunity to attend a weekend workshop at Nimrod Hall again. 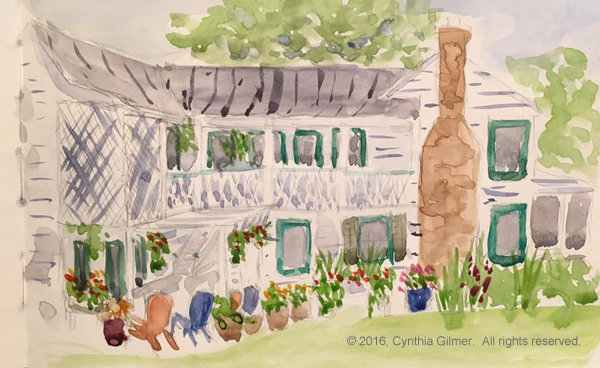 This year I chose the weekend workshop Kirah Van Sickle, who is an impressionist landscape painter based in Wilmington North Carolina. Her work is wonderful and fluid, and I was hoping she could help me get out of my head a little. Kirah paints mostly in acrylics and also does some mixed media. The class was open to people who wanted to paint in oil, acrylic or watercolor. 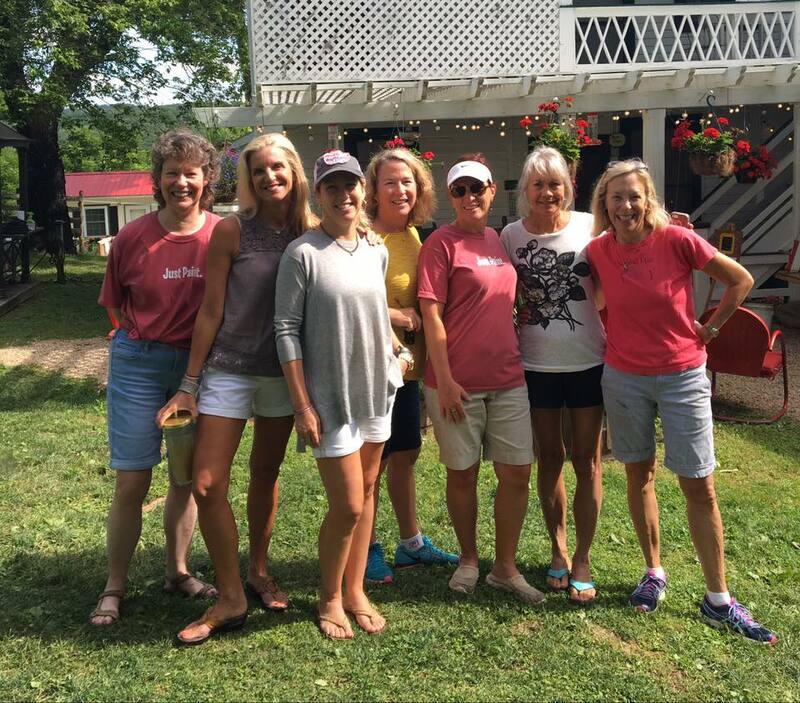 We had a good group of ladies who took the class including Julia and Emily who took a different workshop the same weekend as me last year, Molly, Susan and Carol. Everyone got a lot out of the class. One of Kirah’s first suggestions during our Friday evening discussion is to paint fast and loose. Most paintings will be studies, so don’t start with the idea of having a finished masterpiece. I have heard this before and know it. Being basically an impatient person I tend to paint fast. The thought that the painting I’m starting isn’t going to be a masterpiece is a challenge. Yes, I know it’s unlikely, but I have to start and approach the painting believing that it will be good – otherwise, it won’t be! I have to say, one of the things that came from the class was getting back to some basics. I have gotten away from staining my canvases in advance and doing a good underpainting. Kirah showed how important that was to doing the value study with is a key to a successful painting. Doing a value study allows you to identify and capture the dark and light areas of the painting without regard to color. She also said that most paintings will probably only have two to four values, which are easily captured using a burnt sienna underpainting. Underpainting in oil is different than underpainting in acrylic. Acrylic dries really fast so you can just paint on top of it. Oil dries very slowly. If you’re doing plein air in a single session you can’t wait for it to dry. One of the things she showed me was how to paint on top of the underpainting without picking up too much of the color. Put lots of paint on the brush, hold it sideways, drag and pick it up. This keeps you from actually mixing the colors. She also pointed out that it’s critical to use a big brush and not be stingy with your paint if you want to get an impressionistic look. You also need to choke up on the brush unless you’re trying to make fine lines. When I used to paint in acrylic as a beginner I used to paint back to front, meaning you paint objects in the most distant background first (like the sky) and then work your way forward. Oil and watercolor have both broken me of that. However, Kirah pointed out that it’s a perfectly acceptable way to approach a painting (except watercolor where you have to paint by value). With oil, you need to use the brush well, as described above, but you can paint back to front. I always struggle with painting things a different color from what they actually are. My very literal engineers brain gets in the way. 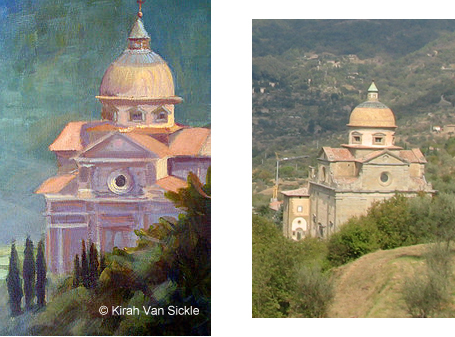 Before class I saw a painting of Kirah’s on her website of a place that looked so familiar. I went back and looked at my photos and discovered I had a photo of the exact place from almost the same angle from a previous trip to Italy. I’ve looked at that photo and thought about painting it several times, but it just doesn’t inspire me. The colors are too muted and as a result it’s kind of boring. Kirah’s painting was so much prettier than reality because she’d brightened up the colors. I learned from her that it’s okay to change the color as long as you don’t change the value. Here is her painting (left) next to my photo (right). One other point that she made was to pay attention to the undulation of the landscape. There’s a rhythm to the scene where things go up and down. It’s important to the composition to catch that rhythm. I painted two paintings in the class. I had trouble finding good light to do these photos, so they are not the best representations. The first painting is a landscape from one of Nimrod’s many porches. I did this in oil. It had the Blue Ridge Mountains in the background with a field in the mid-ground all surrounded by lush foliage. 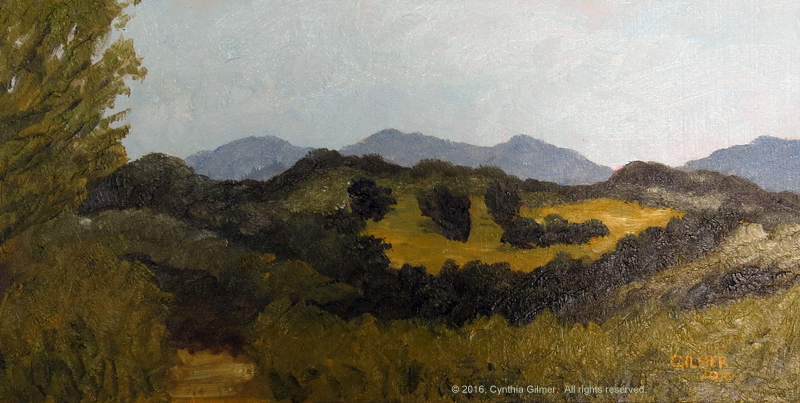 This painting is 20×10 and is on a Belgian linen canvas board. The second painting is of the Nimrod studios and it is done in acrylic. I haven’t painted in acrylic in years, but Kirah offered to allow us to share her Golden Open Acrylic paints. These are specially formulated to dry slower than regular acrylics, allowing them to be blended on the canvas more like oils. They did dry slower, but out in the open air, they still dried pretty fast. This painting is 24×8 on canvas. 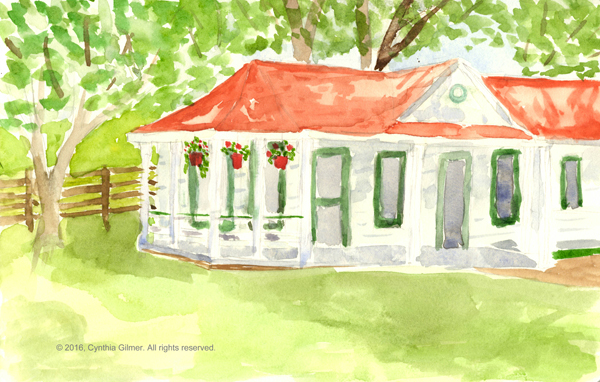 In addition to my in class painting I also did some watercolor sketching of the buildings at Nimrod. Because it’s World Watercolor Month I posted these on Facebook. I have a friend who is interested in buying them. Now I’m challenged with repainting them since they are in my sketchbook on low quality paper. This will be a good exercise for me, since the thing she likes about them is their spontaneous sketchy quality. I will need to stay out of my head to keep that as I redo them. All in all it was another great weekend at Nimrod. I’m already looking forward to next summer.